Trailblazing cowpunks The Johnnys are back and will be playing their first Melbourne shows in almost a decade in February. 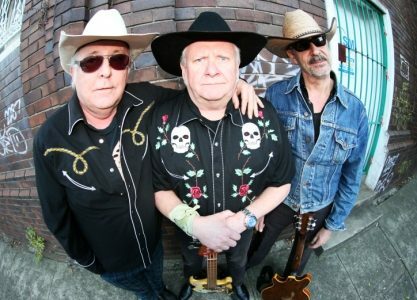 The current line-up of Graham Hood (bass and vocals), Slim Doherty (guitar) and Billy Pommer Jr (drums) has chalked up shows in New Zealand and Sydney in the last year but have been itching to come to Melbourne. After an initial seven-year career in the ’80s, thousands of kilometres and innumerable demolished backstage riders, The Johnnys were Australia’s indisputable, rough riding champions of cowpunk. They formed in Sydney in 1982 when Kiwi-born bass guitarist Graham Hood (ex-Normals) tried out for the Hoodoo Gurus after quitting the Allniters. He met Hoodoo Gurus’ guitarist Roddy Ray’da and, with drummer Billy Pommer Jr, they formed The Johnnys, playing their first show at Palms Disco on Oxford Street in Sydney. Another Kiwi, the legendary Spencer P. Jones, joined on guitar and the four-piece released their single “I Think You’re Cute” in October on Regular Records. Ray’da left and the band signed with independent label Green Records before joining major imprint Mushroom. Spencer’s recent passing gave The Johnnys pause to reflect but they have continued with his blessing and are honouring his memory. They racked up eight singles and three albums, playing almost every pub and club the length and breadth of Australia and convening an instant party wherever they went. Older but none the wiser, The Johnnys are still a portable party and one of the best rock and roll nights out around. Their two Melbourne dates are sure to sell out. This is the only gig for There’s Gonna Be a Showdown w/ The Johnnys, better be quick!